In a large pan add the butter and garlic. Cook for about a minute over medium heat. Add the rice and cook for 5 minutes. Stirring occasionally, so the rice does not burn. Add the chicken broth and the 1/2 teaspoon salt. Bring to a boil. Stir once, turn down heat to medium-low to low and cover. Cook for about 15 minutes or until the liquid is absorbed. While the rice is cooking prepare the rice. Heat the olive oil and butter in a skillet. Add the green pepper, red pepper, onion, garlic, and red pepper flakes to the skillet. Stirring constantly cook the vegetables for about 7 to 10 minutes or until tender. Season with salt and pepper to taste. 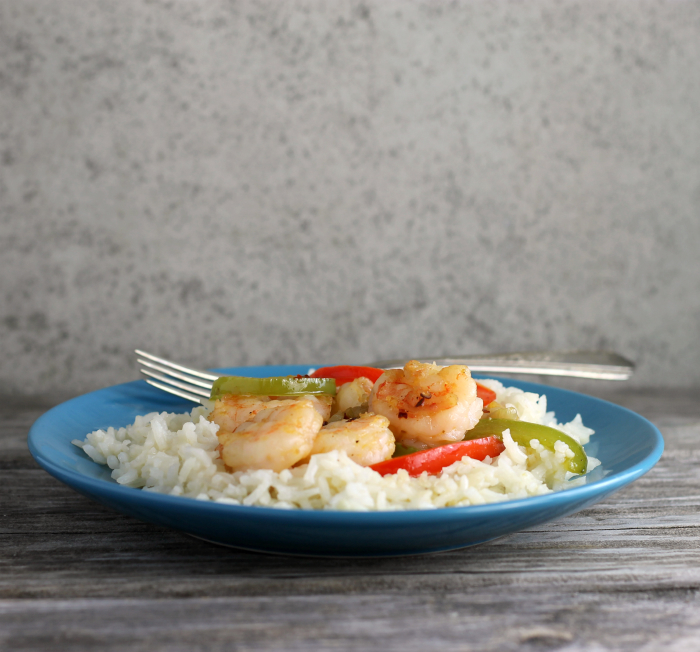 Place a serving of rice on a plate and pile the shrimp and vegetables on top of the rice. If you prefer you can add more of the peppers and onions.